Blast off to fun with this exciting packing puzzler! 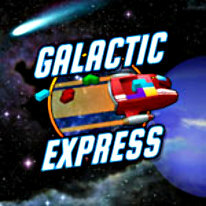 Your mission: Take command of Galactic Express – the busiest shipping station in the galaxy! Engage your expert packing skills to load colorful cargo into transport ships before they launch to destinations across the universe! You’ll earn power-ups and profits as you fill special orders from the solar system and beyond. Feeling energized? Play the Delivery Mode to see how fast you can fill your orders before the countdown launches your ships. When you’re in the mood for star-gazing, play Casual Mode and enjoy the view as you decide when your ships are ready to go. Get ready to have a blast with this exciting packing puzzler – it’s out-of-this-world fun!